I love running in the summer, and I believe it’s a great time to run (and so is every season of the year duh!). Nonetheless, heat and humidity can wreak havoc on your running routine, especially if you don’t take the right precautions. When you are running outside, you are exposed to the elements. And one of the hardest, maybe the most difficult, element for runners to in train in, is the heat. While exercising under steamy and hot weather conditions, your body temperature runs higher than normal, you sweat profusely, which forces you to work harder but still run slower. But fret no more, by the end of this blog post, you will know exactly what to do to ward off most of summer running dangers as well as how to make the most of your training program in the upcoming months. With that said, and before I share with you some of my best summer running tips, let’s first take a look at why running in the summer is so damn hard. 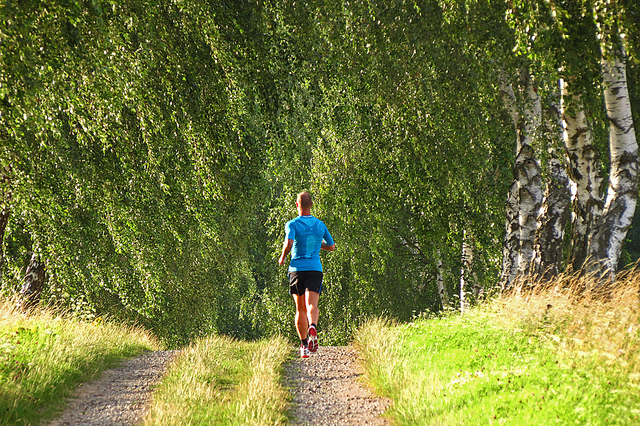 Running in the summer is hard for mainly three reasons. The sun and the heat can make running more problematic because both increase core body temperature. Of course, when you run—or do any other form of exercise—your core body temperature naturally rises, and your sweat glands produce drops of sweat that carry the extra heat to the surface of the skin, where it dissolves and evaporates. But, when you run in the heat, your overall body temperature increases immensely. Once your body temperature reaches scorching heights, running will feel like a march through hell, and your rate of perceived exertion is significantly increased—even if you are running at your normal and usual pace. The Result: less blood is available to transfer oxygen to your working muscles, which forces you to slow down and increases the perceived exertion level. Your sweat system gets compromised when your overall body temperature is higher than normal. Our sweat system gets hammered the most during the summer, and it can make or break your running schedule. Perspiration is vital for cooling the body off because as the sweat reaches the surface of the skin, it evaporates, taking the excess heat with it. But the heat, as noted earlier, can hold back sweating process, making it harder and harder for the body to process the heat out. The Result: When you sweat almost as fast as your body can produce the stuff, your body can, literally, overcook itself, setting the stage for severe dehydration and a host of heat-induced issues. With dehydration comes also a host of trouble. As you run more with a dehydrated body, your heart rate tends to be higher than normal since it has to work double time to pump blood, which becomes increasingly thicker, and deliver oxygen to your working muscles. This is known as cardiac drift: your heart rate goes through the roof with little or no change in training intensity/workload. In other words, your whole cardiovascular system has to work extra hard in the heat. The Result: Your body will enter the danger zone, which is a baaaaaad thing. When your core temperature rises and you get more dehydrated, your body will, mainly, go into survival mode, keeping the blood flowing to your skin—as means of controlling and regulating core body temperature, and to your vital organs—to, basically, keep you alive. This “survival mode” causes a significant number of problems, including GI distress (less blood to the GI tract, hindering the process of digestion), side stitches (as your breathing gets faster and more shallow), you may also feel dizzy and nauseous, along with a host of troubles that can wreak havoc on your running performance and enjoyment. 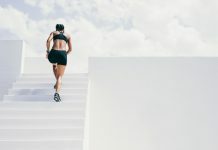 Whether you are planning to train for a marathon this summer or are just trying to keep a consistent running routine, there are still plenty of steps you can take to make the most out of every run you do. Therefore, here are my tips on how to cope when running in steamy weather conditions. To kick things off, you need to realize that checking temperature alone is not enough. Why is temperature not that important? Well, it’s not just the heat that can get you down during summer running, humidity is the real concern. Humidity can really slow you down, making it harder for sweat to evaporate off your body. As a result, before you reach for your running shoes, make sure to check out the National Weather Service’s Guide for the heat index, which combines temperature with relative humidity, providing you with apparent temperature—that’s how it actually feels outside. If the temperature is about 70 degrees, while the relative humidity is above 40, you’d need to dial back pace by at least one minute per mile. Don’t run outside if the temperature is above 96 degrees and the humidity is above 75 percent. That’s dangerous territory. Instead, move your workout indoor; otherwise, you are risking heat-induced trouble, like a heat stroke, and a plethora of other trouble. The heat index is just one measure, another index that you should check out too—especially if you are living in a big crowded city—is air quality. Get current reports by checking out your weather TV’ station website, or using an app that provides both heat index and air quality index for your region. For instance, if the code is orange and you already have some respiratory problems, or you are too sensitive to air pollution, then you might want to reduce your running intensity level—especially on days with extreme heat and high smog. In case the code is red, I suggest that you run another day or take your workout indoor. Running in the heat is hard, and when temperatures reach sizzling heights, you should consider taking your runs indoor just to stay safe. As I noted earlier, I strongly urge you not to run outside if the heat is above 96 degrees and the humidity is above 75- to 80 percent. Better be safe than sorry. Consequently, if it’s appalling outside or there is a heat alert, or poor air quality, move your workout indoor and hop on a treadmill instead. The treadmill can not only help you keep running throughout the summer season, but also help you become a better runner. On the treadmill, you can watch your form (or have others critic it for you), follow a good program at a controlled pace, simulate race pace runs, do plenty of intervals, incline sprints and long runs, and best of all, you can do all of this in the air-controlled space of a gym or a house. For more treadmill running tips, check my post here. If the treadmill is too boring, then cross-train. Take a spinning class, try CrossFit, or join a swimming club. Just do whatever you like and never stop. The human body is an incredible machine; nonetheless, it needs time to adjust to hot weather conditions. 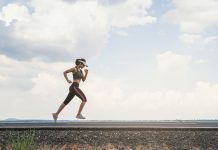 As this adaptation takes place, your body will get better at cooling itself in the heat by becoming more efficient at decreasing heart rate, reducing core body temperature, and increasing sweat rate (and start sweating earlier into your runs), thereby allowing you to keep on running at your normal pace. As a result, you shouldn’t be pushing it here. Just because you were able run a 10K under 45-minute during the spring, doesn’t mean you can do the same when weather condition out there are scorching hot. Give your body at least a couple of weeks to acclimatize to summer weather conditions, increasing gradually the intensity and length of your runs. Do it in a safe and slow manner, not haphazardly. Therefore, during the 15 days of hot weather, don’t do any speedwork sessions. Instead, keep your midday runs easy and short. Once your body has well acclimated, then you can up the ante. When it comes to running in the heat, proper hydration is a no brainer. Hydration is a vital element to staying cool and running your best in all sorts of weather conditions—not just when it’s hot outside. Ignore it at your own risk. Proper hydration goes without saying. If you are well hydrated, then you are going to decrease the risks of the onset of dehydration, thus be able to avoid heat-induced trouble. Therefore, during the hot summer days, build the habit of drinking water all day, not just before or after your runs. Keeping your body well hydrated throughout the day can prevent a handful of the symptoms you may experience from running in the heat, such as stomach cramps, lightheadedness, and headaches. As a general guideline, drink at least 16 to 20 oz. of water in the two hours before a run to ensure proper hydration levels. Doing this also gives your body sufficient time to process the water so you won’t have to take many pit stops during your workout. However, if you are a runner who sweats a lot or who has major problems running in the heat, then water may not be enough. You may want to have a nutritional supplement to store extra water—what’s known as hyper-hydrations in the endurance circles—helping you stay hydrated for a longer period. Some of the best hyper-hydration options include any type of fruits that score high on water, such as watermelon, grapes, honeydew, and cantaloupe. These fruits are also a great source of energy on the run. When it comes to drinking on the run, it really depends on how long you are planning to be out there. For shorter runs, anything less than 30 minutes, you probably won’t need to carry any water with you. Nonetheless, if you are planning to run for more than 45 minutes to one hour, then you may need to put on a hydration belt or stash water bottles at planned points along your route ahead of time. Or you can also plan routes around water. This simple strategy may seem like overkill, but it’s worth it if you want to stay well hydrated without having to carry water with you. I’m not a big of a fan of carrying a water bottle with me while running. I find it distracting, and sometimes a burden. Instead, whenever I’m designing a running route, I make sure to come up with a route that takes infrequent water stops. I consider gas stations, water fountains, health clubs, convenience stores, hospitals, city parks, or any other place where I can have some water and stay hydrated. This should be your fallback for those scalding days. While running, toss down at least 6 to 8 ounces of fluid every 15 to 20 minutes. And to err on the right side, never use thirst as a measure for lack of fluids. In fact, if you feel thirsty, then you are already in dehydration territory. To be honest, I was not born as a morning person. I became an early riser out of necessity. And according to my experience, running first thing in the morning is the best way to staying consistent with your workout routine, as well as helping you ward off summer running problems. In most parts of the world, the morning is the coolest, most serene part of the day, making it the ideal time for a workout. Therefore, do your best to run at cooler times of the day—whether in the morning or later on in the evening, preferably, If it’s a possible thing, do the bulk of your running at sunrise. Even during the hottest days of the summer, it cools off considerably by dawn, or later in the evening. The hottest part of the day—and most linked with trouble—is usually between 10 pm and 4 p.m. You shouldn’t run around that time unless you are an elite running prepping for a crazy endurance race, such as Marathon Des Sables, or when your life depends on it—like when you are chased by a wild animal or an assailant God forbid. The heat will make you sweat more than usual, so be sure to wear the proper clothing that will help you wick away the sweat, key for warding off overheating and chafing. The right clothing will allow your skin to breathe, pulling moisture away from your skin and letting it evaporate much faster, which can keep your core temperature cooler. As a general guideline, steer clear of cotton made fabric, which does not breathe well and become heavy when drenched with sweat. Instead, wear light colored, loose–fitting, sport specific synthetics with wicking properties, usually made of polyesters. Some of the best technical fabrics out there include CoolMaw, Dry-Fit, Lycra, and Nylon. For more protection from the sun rays, be sure to wear sunglasses, and a hat as well. A good set of sunglasses will help you keep the sun out of your eyes as well as the sweat. However, not all sunglasses are a fit for the job. The right sunglasses must provide a 100 percent UV protection, and filter both UVA and UVB rays. Well, just like clothing, the hat has to be made of light fabric that doesn’t hold on sweat. What’s more? You could also soak your hat up in cold water before a run, or in the middle of your workout, to help you cool down on the spot. When you run under direct sunlight, you won’t only be compromising your running performance, your skin is at risk too. In fact, according to study, runners are at a higher risk of skin cancer and other skin damage. Why? Because the average runner, and in most cases, spends more time outside and wearing less clothing than the average Joe. Therefore, make sure to lather it up. Use a waterproof sunscreen that has an SPF of least 15 with broad spectrum protection; this means that it offers protection against both UVA and UVB rays—the two most damaging forms of ultraviolet light. Rub on the sunscreen at least 15 minutes before you head out the door. And be sure to lather it up even on partly cloudy days since harmful sun rays are not blocked by cloud cover. Keeping your body well hydrated can surely help you reduce the risks of overheating, however, by pouring a little of water on your head and neck, you will provide your body with an instant cooling effect and help boost up evaporation. This is helpful because blood flows close to the surface of the skin on the head, face, and neck. You will also enjoy and have a durable effect as the water slowly evaporates from the surface of your skin. And if you have the time and the willingness, you might also consider taking a quick shower 15 to 20 minutes before you run. This is what’s known as “workout pre-cooling” and it’s a scientifically proven method to help you improve performance in hot conditions. According to a German study, pre-workout showering improves athletic performance in the heat, because it reduces core body temps and heart rate. Therefore, before you head out of the door, hop into a cold shower. Sure, it’s weird to have a shower before a run, but the cool water will help a lot. You don’t have the time for a full shower? Then grab an ice pack and use it to cool down your neck and head for a couple of minutes. Avoid running on asphalt and concrete because these two retain heat and radiate sun rays into your face, making you overheat much faster and tire sooner than you would like to. Instead, run on grass or trail and gravel paths. The park is a great option too. If that’s not an option, then seek running routes that provide the maximum shade. As a precaution, be sure to let your friends and family know your running route so in case you didn’t make it home at the right time, they will know where to look for you. What’s more? For more safety, make sure to carry an ID, a phone, money and a list of emergency contacts at all times. Better be safe than sorry. If safety is an issue, then check my full guide to runner’s safety. Start off your runs with a proper warm-up—at least 10 minutes of slow jogging—then stick to an initial pace that’s slower than your average tempo. This can prevent overheating early in the run, helping you stave off premature fatigue, even muscle cramps and injury. In the words, the slower you start your runs, the longer it will take for your core body temperatures to reach the misery threshold. So as a rule of thumb, start your runs slower than you usually do, or used to do in the spring or under cooler weather temps. If you are used to running, for example, a 9-minute mile pace, then do your first few miles at 10- or 11-minute pace. You can also implement a dynamic warm-up that includes lunge series or some ballistic stretching to loosen up your running muscles and get your body ready. Before your body adapts to the hot season, you need to take it real slow. The key thing here is being able to manage your core body temps and not letting it increase too much, setting the stage for heat-induced trouble and overtraining. Your body is just like a car, if the temperature increases too high, it will overheat. And we all know that ain’t a good sign. As a result, during your first few runs during this summer, do a three-miler or a very easy run—depending on your fitness level of course—two to three times per week for at least the first two weeks. Even if you are used to running an 8-minute-per-mile pace, in the steamy summer, 9-minute mile may be the norm. That’s 100 percent OK, and you shouldn’t lose sleep over it. During the summer, as noted earlier, your body—especially your heart—has to work double hard to keep you running in the heat. Hence, risks of overtraining and overheating are high. When running in hot weather, heat-induced conditions can lead to serious side effects. These happen when your body falls short on regulating its own temperature, so the core temperature keeps on rising until it becomes dangerous, leading to serious health trouble. Therefore, you need to listen to your body and keep on the lookout for any warning signs of trouble. If you notice any symptoms of heat-induced illness (or you just feel bad), then use common sense and stop your workout, or dial it down drastically. It’s not a good practice to push yourself in extreme heat. If your body has crossed the safe threshold, STOP RUNNING immediately, find shade and rehydrate either by drinking water or a sports drink such as Gatorade Endurance. In case you didn’t feel better, you may consider calling it a day, go home, drink plenty of water, take a cold shower, or a sponge bath, and get into an air-conditioned room if it’s possible. You can also try spraying yourself with cool water and wrap your body in cool, damp sheets to cool yourself down. Nevertheless, if your conditions have worsened or the symptoms have not subsided within an hour, then you may need to call 9-1-1. Some of these overheating symptoms can be life-threatening, requiring immediate medical treatment. Running in the heat is as much a mental challenge as it is a physical one. Therefore, you have to train your mind correctly and build the belief that you have what it takes to get the job done. In the end, your state of mind plays a major role. The mind is very powerful, and if you put it to good use, it can help you nudge your body into feeling a certain way. Where the mind goes, the body will follow, as the saying goes. As a result, think yourself cold by using your inner eye to imagine that you are running in a much cooler location. Of course, thinking yourself cold will not change the weather nor is it going to change the fact that your body is overheating and has to work double-time to cool down, but it will ease some of the burden. This can help you stay motivated and consistent with your running routine in spite of the heat. If you study any form of psychology or self-help philosophy then you know that as soon as you give into the mindless chatter, you have already lost. Don’t get me wrong here. I’m not suggesting that you should ignore clear signs of dehydration or heat-induced issues, such as lightheadedness, cramping, and fainting. I’m simply trying to get you to focus on the positive. Add these lines instead: “Thank God it’s not that hot today,” or just keep repeating, just like a mantra, the words, “cool,” “chill” or “colder” over and over again. And as you think cool thoughts, imagine the finish line and how good you will feel once you are done and be able to take a nice cold bath. After a run, gulp down more fluid than you think you need to rehydrate. It’s better to err on the right side here. To make sure you are properly rehydrating, weigh yourself before and after each run to gauge how much liquid you have lost. Next, aim to drink at least 16 oz. of water for every pound lost. Monitor your hydration level by checking the color of your urine—when it’s dark yellow—or when you have a persistent elevated heart rate, even hours after you finished the workout. For runs longer than an hour—especially if you are training for endurance running—water is not enough. Running in the heat for more than an hour can cause you to sweat profusely, losing electrolytes as well. Therefore, in case you are naturally a profuse sweater—since sweating rates are different from one person to the next—or running hard for more than hour— consider adding a sports drink to your hydration arsenal to restore lost electrolytes and carbohydrates. You can also opt for gels, or salty food, such as pretzels, to replace electrolytes losses. In the end, how much you enjoy your runs will be the deciding factor. Therefore, make sure to add a fun aspect to your summer runs. The more you enjoy your workouts, in spite of the heat and humidity, the more consistent you are going to be. Come up with workout playlists around your favorite songs. Do most of your runs on pristine and breathtaking routes. Take your runs to the beach if it’s possible. And have plenty of sponge baths. I believe that I did a good job covering all bases when it comes to a safe and pain-free summer running experience. But now the ball is in your court. It’s up to you to make it happen. So do your best to include as many strategies as possible. In the meantime thank you for checking out my 22 summer running tips.